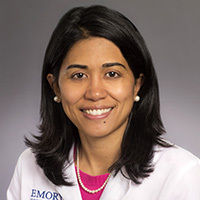 Winship Cancer Institute of Emory University radiation oncologist and researcher Mylin Torres, MD, is the recipient of a three-year, $450,000 grant from the Susan G. Komen® organization. The funds will be used to research ways to improve quality of life among breast cancer patients, specifically as it relates to inflammation caused by treatment and cancer-related fatigue. The announcement came at the start of Breast Cancer Awareness Month. Following through on a commitment to young scientists and clinicians, the Komen organization announced a total of $16.5 million in new grants to more than 50 early-career breast cancer researchers nationwide. "I am grateful for the generous support from the Susan G. Komen organization," says Torres. "The grant will allow me to continue my research into biological causes of long-term therapy related side effects such as fatigue in women with breast cancer." Torres intends to follow patients from diagnosis through to one year after treatment to identify treatment-related changes that turn on and off specific genes, a process called epigenetics. This work will inform future clinical trials aimed at preventing or reversing treatment-induced epigenetic changes that can lead to long-term persistent fatigue. Torres, a faculty member affiliated with the Glenn Family Breast Center at Winship, received early seed money for her research from the Cooper Family Foundation Breast Cancer Initiative. "This grant supports Winship’s commitment to research that improves the outcomes for all breast cancer patients," says Walter J. Curran, Jr., MD, executive director of Winship. "We are proud that Dr. Torres is one of a highly selective group of researchers to receive this funding."